If you've been wondering what all the fuss is about with open-plan living spaces, prepare to totally understand it. We've found three beautiful apartments that aptly demonstrate exactly why combining functional areas, such as kitchens and living rooms, is such a great idea! 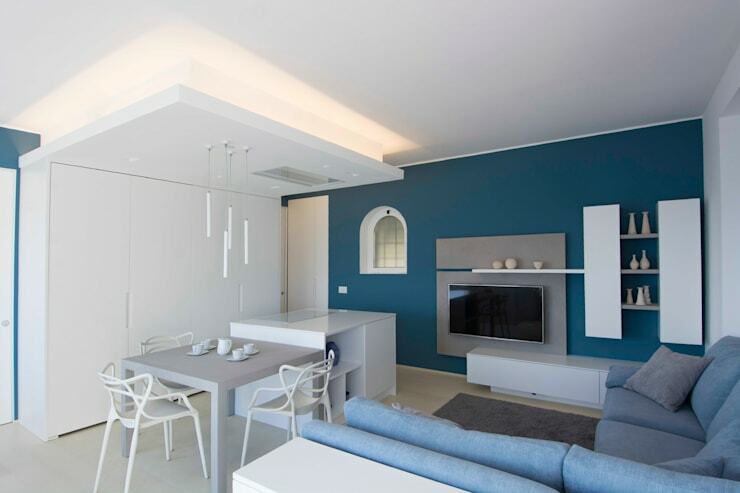 The interior designers that oversaw these wonderful projects had such a great grasp on how to create cohesive, crisp and airy living areas, using white as the main colour, but accenting the areas with fabulous extra touches. So let's take a look and see if you could be tempted to recreate any of these terrific ideas in your home! 1. A cacophony of natural materials. Isn't this apartment stunning? A natural wood wall offers amazing contrast with the piquant stone floor and white walls everywhere else and opens up to reveal a truly gorgeous kitchen as well. 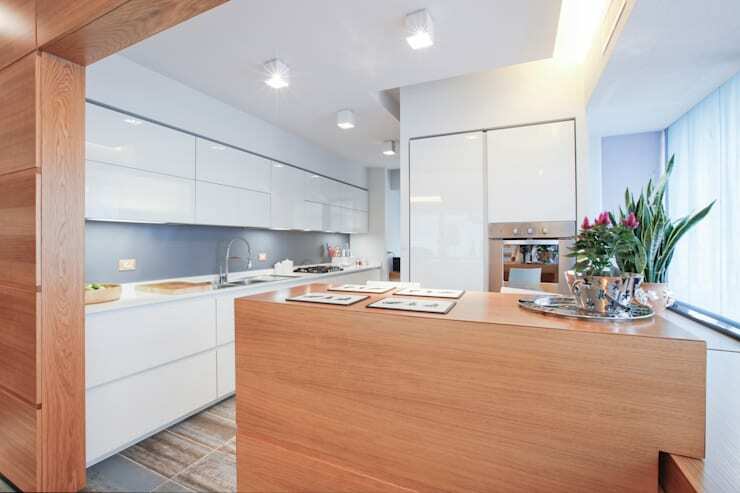 By having a counter instead of a solid wall, there is a fluid dialogue between the kitchen, dining area and living room which makes everything feel so large and airy! The way that the wooden counter here matches the living room accent wall and then gently gives way to an all-white installation is inspired. 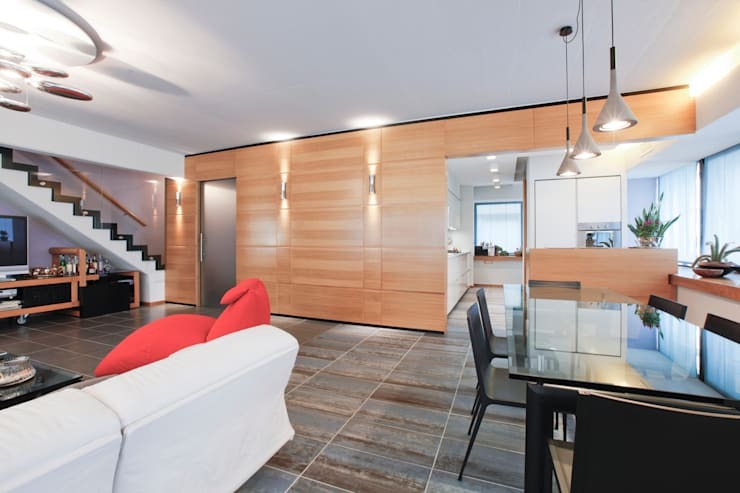 The modern, fresh feel literally radiates out and what would have felt like an enclosed, maybe even cramped room, feels so open and large, thanks to the non-solid divide. 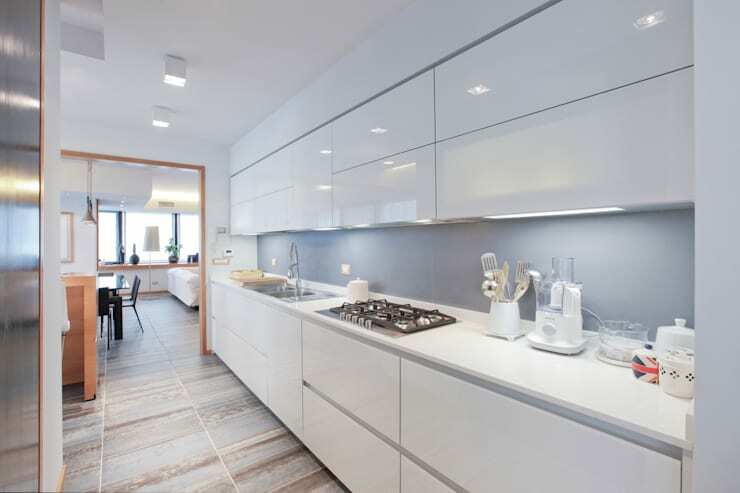 Choosing gloss white cabinets for this kitchen was a fantastic idea, as not only does the light bounce around and maintain the modern fresh feel, they can also be built right up to the ceiling, to give maximum storage potential, without feeling to encroaching. The view out into the dining area certainly isn't bad either! 2. All in one room. This is the ultimate in open-plan apartments, as there are literally no walls or counters dividing any of the functional areas and it looks staggering! Pale grey walls offer an injection of neutral calm, while the white kitchen mirrors the sofa and dining table perfectly, creating a staggered injection of bright furniture. The way everything has been laid out really makes the most of the generous floor plan too! Wow! 3. Innovative use of space. 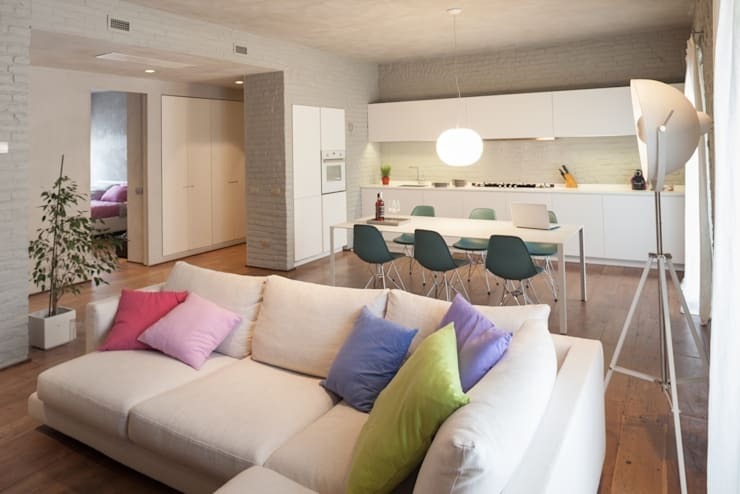 We are in love with this open-plan room, as the dimensions aren't enormous, yet everything works perfectly. A bright accent wall negates what could have all too easily been a sterile and unwelcoming room and allows for a lovely pale blue sofa to break up the area. A bistro dining table and small yet functional square kitchen area all fit together like a perfect jigsaw and allow for easy transitions between cooking, eating and lunging areas. Perfection. For more kitchen inspiration, take a look at this article: 19 beautifully chic kitchens to help you plan yours. Are you seriously considering going open-plan now?